Well another year has swept us by. I survived Christmas by spending all my time off work stripping wallpaper from various rooms within the house, this is due to an impending plastering job to be done by a professional, followed by a huge decorating job followed at some point by new furniture shopping spree. Time in the garden has been severely limited in part due to the weather and the impending work to be done in the house. So far this year, I’ve managed to re-arrange my Hosta Collection. A few breeze blocks and some thick planks, although I need to rebuild this contraption against the house so the plants are in the shade for the summer and not the full sun. I have a few plants in flower, currently my Sarcoccoa is blooming well and the scent carries quite a way in all directions. My Hamamellis intermedia Magic Fire just gets better every season, this shrub was planted about 8 years ago as a weedy specimen and just sulked, but in the last 2/3 years its suddenly gained its feet, put on a growth spurt and flowers like mad. A very pleasing site. The part of the Fence border near the house down from where the Sarcococca is growing has become something of a problem. 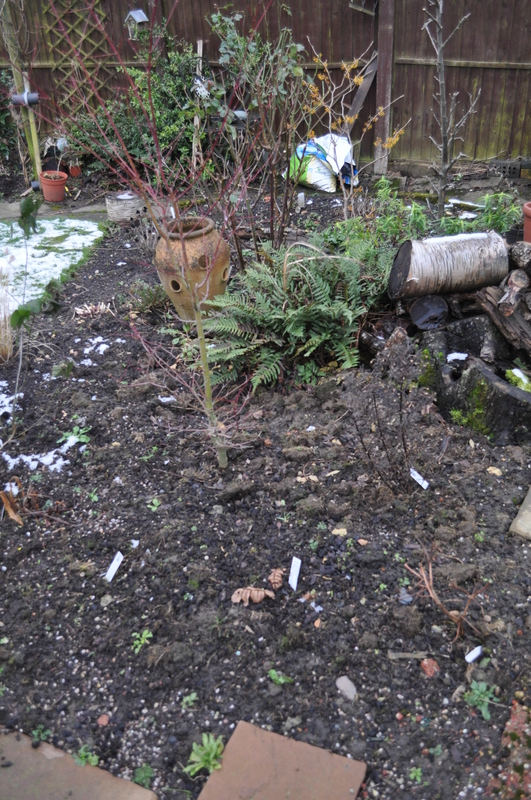 several woody plants have suddenly perished, I have replaced a few plants and have others waiting to be planted, but the symptoms on one of my perished plants, an Euonymas alatus, were consistant with Phytophthora. I’ve purchased an on-line test kit to test a nearby sick Acer, but currently its too cold to use it. I’ve also purchased a PH Test kit in order to rule out all eventualities. 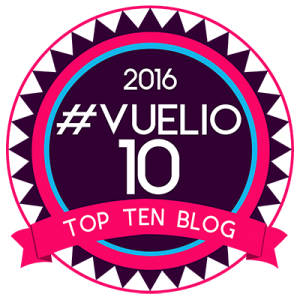 So watch this space. The area where I used to have a wildlife pond is doing well, I just need the plants I put in last Autumn to get through the winter so I can see what gaps are left. I planted my pot grown Acer in the Middle of it, so I can see the Autumn foliage from the house. But I’ve got no idea what all the frogs are going to do now when they turn up this Spring. oops. An area of great contention for me is my old raised bed, this was origianlly an area where I grew Strawberries, and very sucessful they were too. so sucsessful that they escaped and started growing across the lawn, then the birds and mice found the fruits. 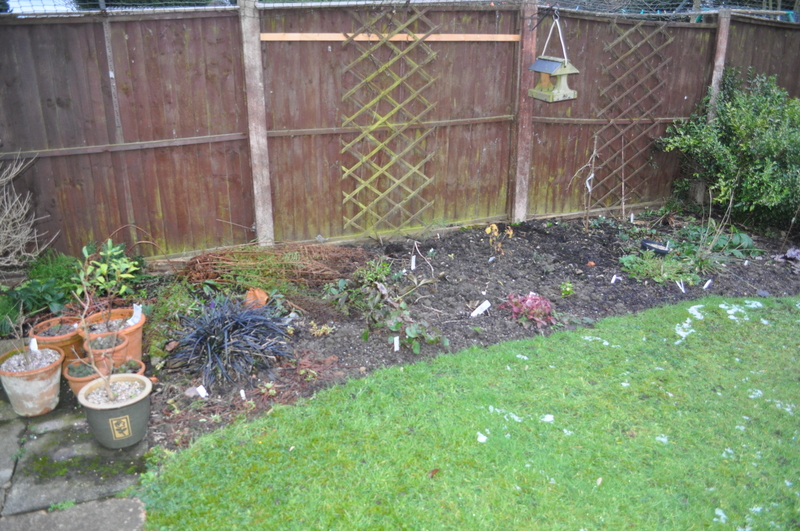 So that was that, I tried Sweet Corn next but it became obvious that the Privet Hedge behind the bed was an issue, the sweet corn failed without any cobs becoming fertilized, so again I dumped the lot. 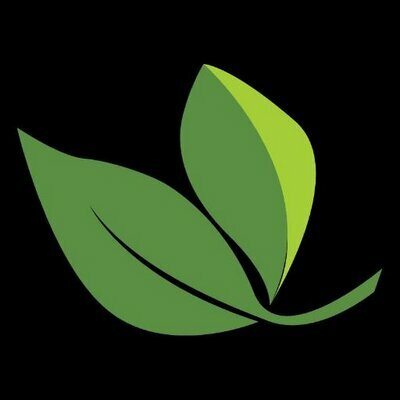 I put weed suppressing membrain over the bed, followed by bark chippings and left my potted Hostas there for a few years, unfortunalty the Hostas just bake and dry out, and need to be relocted, as mentioned earlier in this post. I used to grow some bits of veg at the top of my garden, but over a few years, suffering with slugs, Blight, slugs, mould, slugs and neighbours conifers casting shade, I became dishartened and planted up the area with shrubs, ferns and Herbacious plants. 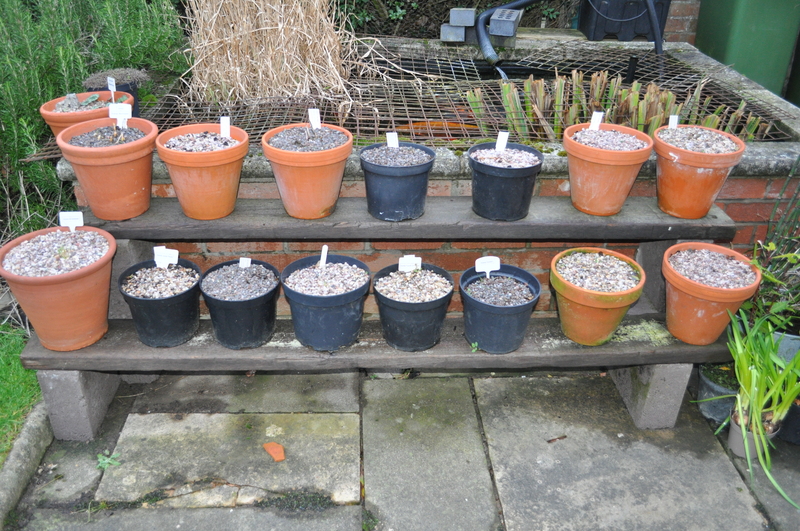 My original Veg plot. 2007. So I’ve been toying with the idea of moving the current raised bed 2ft forward away from the privet hedge, so I can more easily trim the hedge, bring the bed more into the sun, then adding another rised bed in front of it. Rare Ariel view of the garden, taken when I was on the roof last week. (Dont ask).! 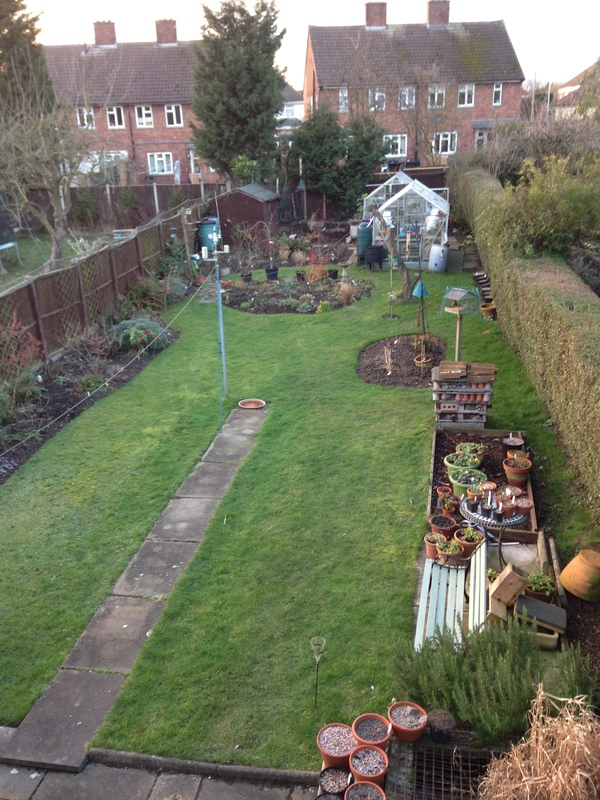 So you can see the curent raised bed on the right, just above the pasty blue bench, I’m toying with plonking another raised bed next to it, well in the middle of the lawn really. 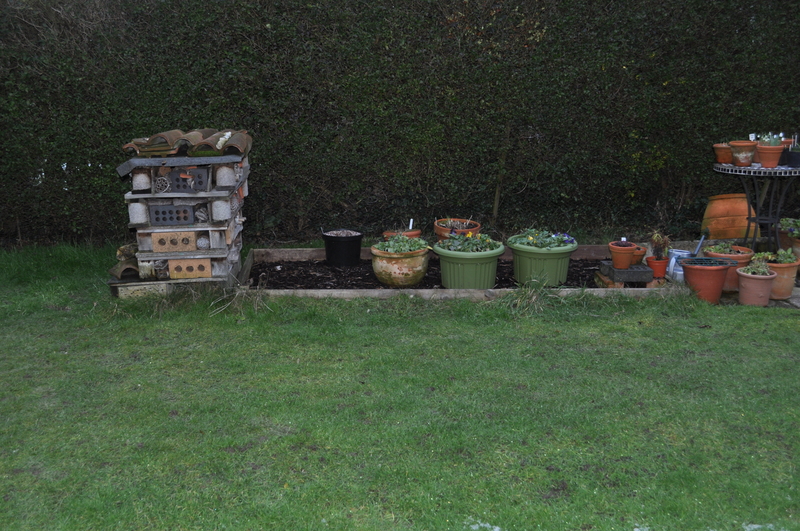 Nice growing area for a bit of salad stuff and Garlic etc… Right out in the full sun. My next project when the wather warms up. Perhaps. As you can see I have quite a bit of lawn, but I’m slowly eating into it in various areas, increasing bed and border sizes so I can get more plants in. My ultimate aim is to only to have grass as paths winding up to the top of the garden to the greenhouses. But thats a way off yet, Him indoors like his lawn, so If i dig a bit up each year he might not notice….I also need to decide for once and for all what to do with the wildlife stack I built several years ago… its served its purpose, and is full of mice, which is in-part now a problem as the cat keeps bringing them into the house to meet me. My heart says let it stay, but my head says get rid. 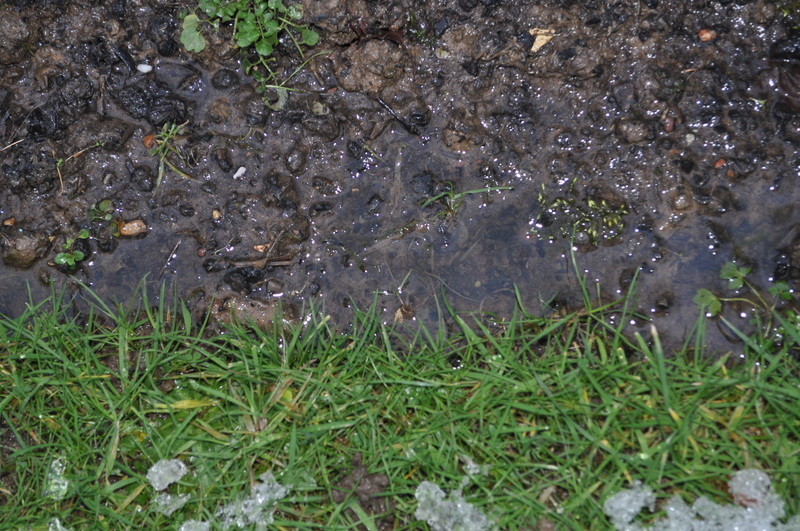 But finally, on top of possible Phytophthora, the recent snowfall and rapid thaw have reveiled another problem…. My garden becomes a swap over recent winters and I’m not sure what I can do about it. I’ve dug sharp git into problem areas, the lawn squelches when walked on, and i’ve got small puddles along the edge of the lawn. Perfect conditions for Phytophthora. So lots of projects planned, no time to implement any of them as yet, need to get the house re-plastered first, and every dry weekend is a bonus. And the shed needs a serious tidy up. Your garden is coming along quite nicely…My climate is very similar to your so my garden is almost in an identical spot. 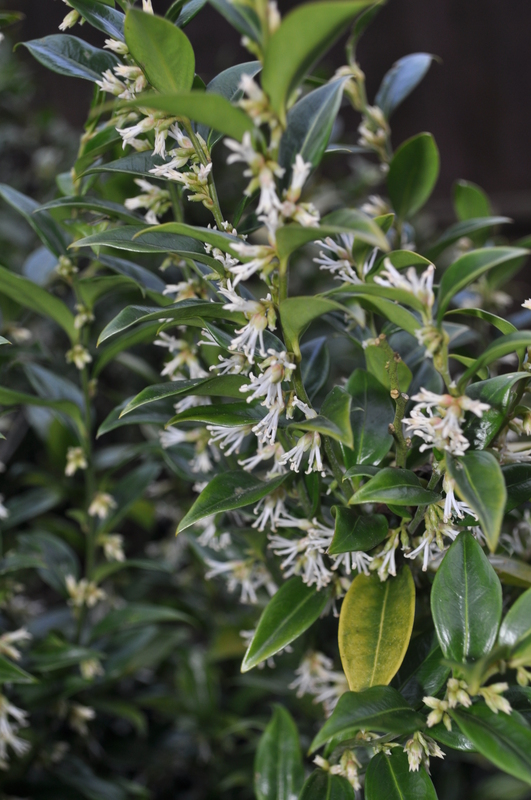 The sarcococca is in full bloom and I have crocuses, naked ladies, and early peonies all coming up through the ground…It is going to be a very interesting year. 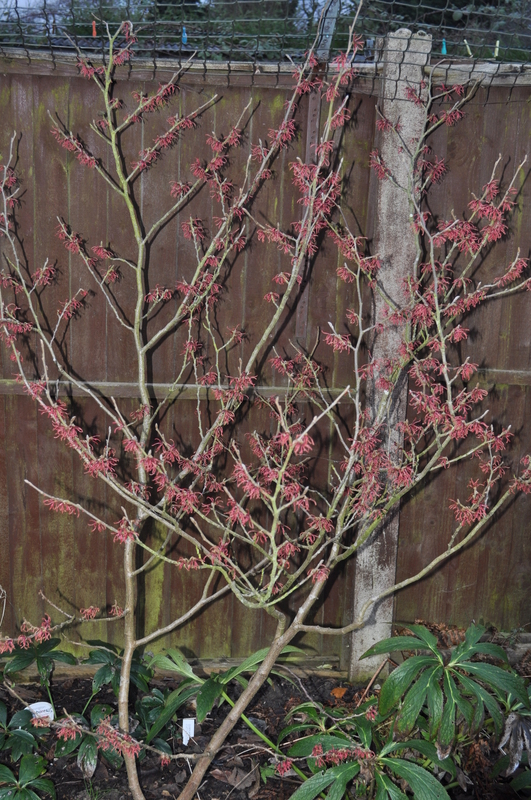 I love that Hamamellis intermedia magic fire – wonderful colour. As a fellow boggy area in the garden sufferer I totally sympathise with you. I’ve decided to just go with it and put in boggy loving plants. I haven’t come across Phytophthora as a problem, but I’ll keep an eye out now that you’ve mentioned it.